Remember those rascally first graders I taught to knit? They've made a 3 pound ball of finger knitting. They wanted to knit something for "someone who needs it" but they also wanted to be able to visit their knitting. A blanket for the nurse's office at their school. For kids "who don't feel so good and are cold"
I'm doing most of the knitting, but every kiddo in the class will do a few stitches. Go first graders! 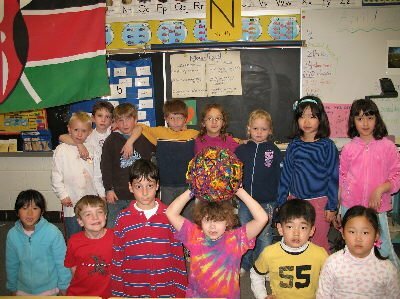 Once I taught my whole class (also first graders) and they made a big felted thing for our school auction. A few of my kids are learning this year too. Dang, that is some big ball of finger knitting. They're going to fall on the playground just to be able to visit the blankie! This is so cool!! Bless you and your class. 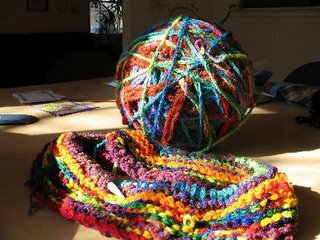 My first thought was, "that's a big ball of yarn." My second thought was," Are there really only 14 kids in Isabel's class?" My son's first grade class (in a South side Chicago public school) has 33 kids. Other cities look more attractive every day. I had the same thought as Shannon! I hope you'll post a picture of the blanket when it's done.